Unfortunately, I did not have time to tinker with the machine until the machineroom had to be set up for storage. 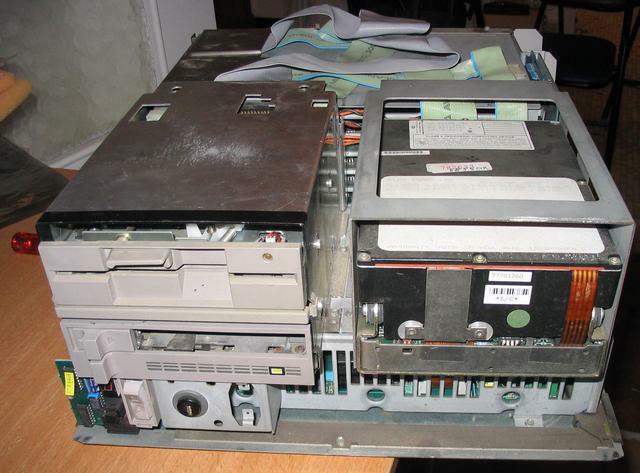 It was only years later that I found time to play with this machine, only to find out that time had taken its toll, and that the disk drive, as well as several boards in the machine, were no longer in working condition. The machine was then recycled in 2010. Unlike the Apollo DN 300, I did not consider it worthy of being saved by a museum. The entry-level LSX 3005 comes in a large desktop case, with two half-height 5"1/4 drive bays, as well as one full-height 5"1/4 internal drive. There are no connectors whatsoever on this machine, but the serial port on the side of the machine. 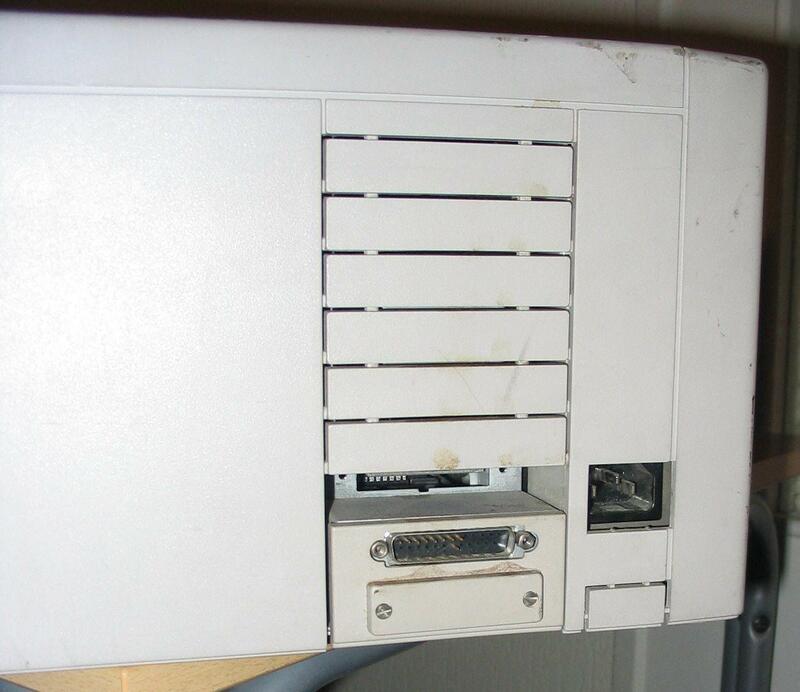 Above it, the hole exposes a connector on an internal board; this board is a multiport serial controller, and a special cable connects to the board and exposes four DB9 serial ports. It is unknown whether there was an Ethernet option for model 3005; if there wasn't, the only way to get networking on this machine was to use UUCP or SLIP. The case cover is easy to remove. You can see that the front half of the machine is used for storage devices. 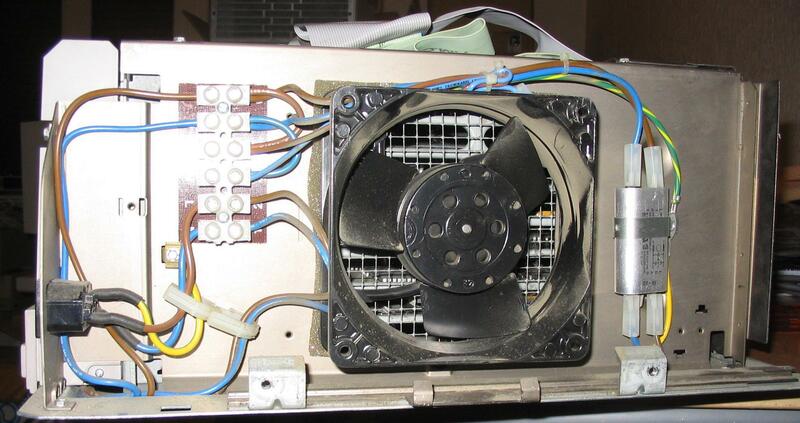 ...which makes sure there is correct airflow inside the 8-slot cardcage. 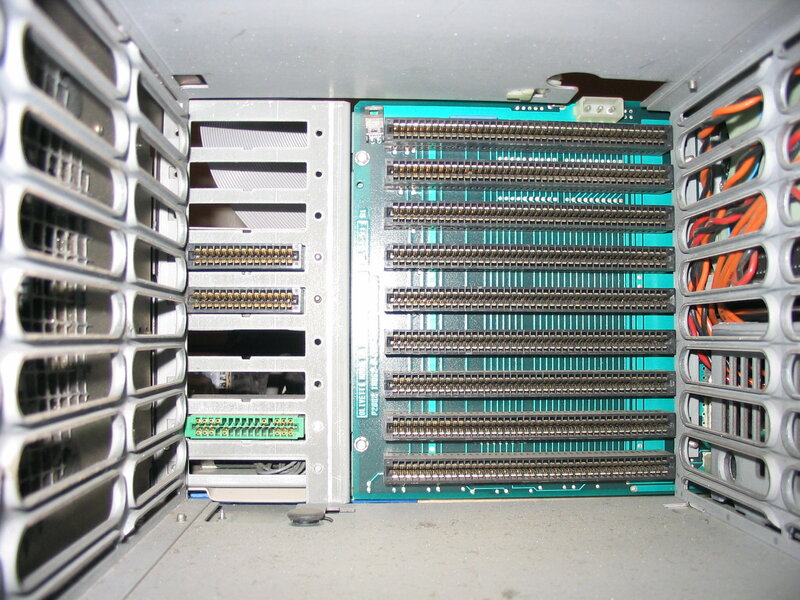 In this picture, you can see two boards in the cage; the lower board is the CPU board, while the upper board is the I/O board, providing serial ports and a disk connector on the front. 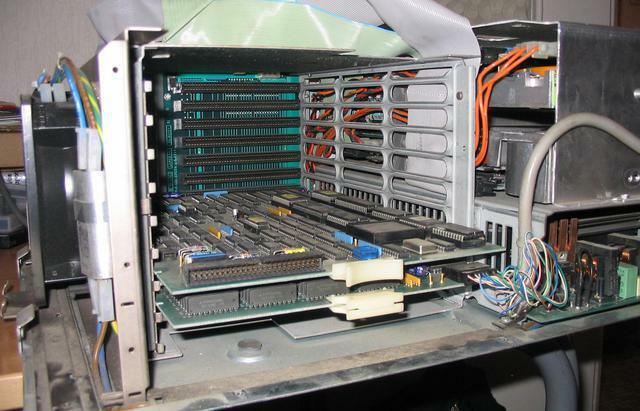 Here is what the empty backplane looks like. The right part looks like ISA slots, while the left part is board-dependent: the 2nd, 5th and 6th slots (counted from the bottom) having a special purpose. Here is a closer view of the processor board (in the bottom slot). The processor is a 20MHz 68020 (immediately above the 3-cell battery pack), with a 20MHz 68881 FPU (the other bright Motorola chip, to the right). 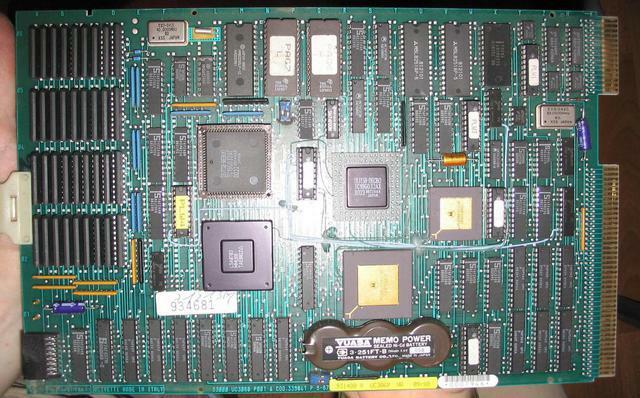 Note the black square chip, to the left of the processor, is labeled MMU68: this is likely a homegrown MMU, as Motorola's 68551 was not available at the time these systems were designed, and the earlier 68550 was probably not deemed adequate.